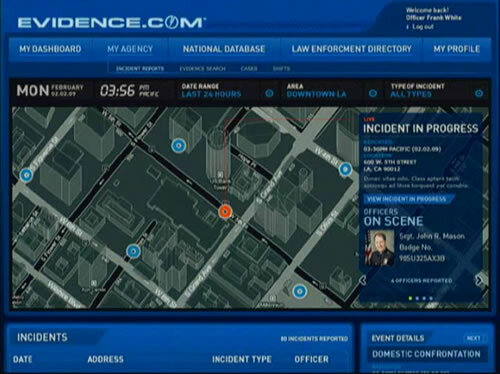 Evidence.com from TASER provides police officers with a virtual evidence warehouse from which police and legal professionals can quickly access data gathered from live headcam cameras. First, the AXON HeadCam is activated by a police officer on the scene. Once activated, video and audio evidence is gathered and stored in the Com Hub. 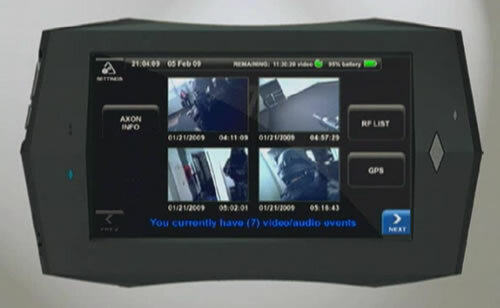 An ATC - Axon Tactical Computer - can be used to review the evidence gathered. The ATC has a good quality display with an iPhone-like interface. At the end of the shift, police officers place the ATC in a cradle - the Synapse ETM (Evidence Transfer Manager - which both recharges the unit and uploads all of the data automatically to Evidence.com, an online data repository. Prior to uploading the data, a double hash algorithm provides a digital "fingerprint" to verify that this is an original unaltered file. This method provides a faultless chain of custody for this audio and visual data. The Evidence.com site is configured to scale to 100 petabytes of storage; they hired a key Microsoft executive who had worked on a project requiring large-scale storage of user data. The company also provides analytics to pull information out of the raw data entered each day by police officers. This is more than just file storage; it generates "geospatial multimedia information" to present important trends to users - police administration and police officers. For example, take a look at the screen below, which shows a map tagged with incident reports. Clicking on a red incident dot opens up the video file, showing the user exactly what was recorded. Officers can annotate this video, adding their comments to file; the user sees a multimedia report. It is even possible to do "perspective hopping" when more than one officer has responded to a scene and has provided their own video. Officers can readily search the case files of other officers; they can add to or otherwise annotate the case file of the original arresting officer. Finally, take a look at this screen under development (below). 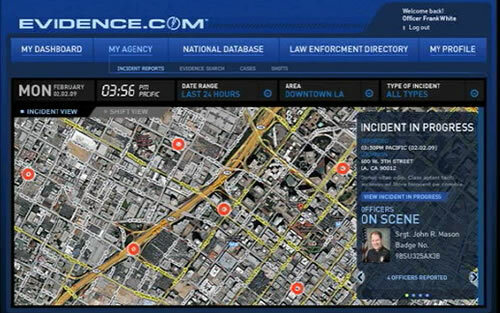 It shows a real-time display of an incident in progress, its location and the location of other officers able to respond. Note the three-dimensional building images and other features. This display can be made available in the field to other officers as well as to police administration. Fans of sf author Charles Stross have no difficulty in recognizing CopSpace, a virtual location for police lifelogs and all other relevant information. In the novel, police use their personal cameras and specs to put audio and visual information in their lifelogs up in CopSpace. One key piece from CopSpace seems to be missing in the TASER Evidence.com real-world system. In the novel Halting Space, officers can readily see information from CopSpace in the field. They look at information imposed on their field of view using their overlay specs. I'll bet that police officers able to browse the web on in-car laptops or cell phones will be able to get what they want from Evidence.com. 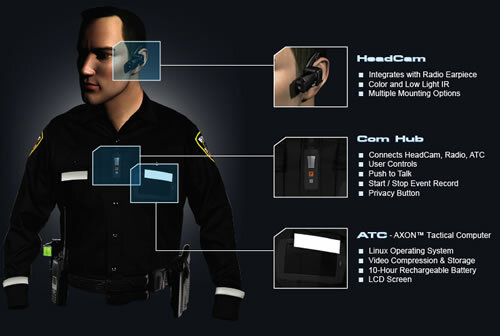 Take a look at some other efforts to create headcams for police officers. Read more about the Evidence.com website, which will not go live until the summer of 2009; take a look at this AXON TASER brochure (pdf). See a nice TASER Axon webcast video (160 MB .wmv file). Thanks to Moira for providing the tip on this technology.